Glaucoma, which is characterized by loss of retinal ganglion cell death, is a leading cause of irreversible world vision loss. Traditionally, intraocular pressure (IOP) is considered as the main reason that glaucomatous optic neuropathy develops . However, as well as an elevated IOP, a low cerebrospinal fluid pressure (CSFP) has been proved to be another factor that related to the pathogenesis of glaucomatous optic neuropathy, especially in normal-IOP glaucoma patients [2–10]. 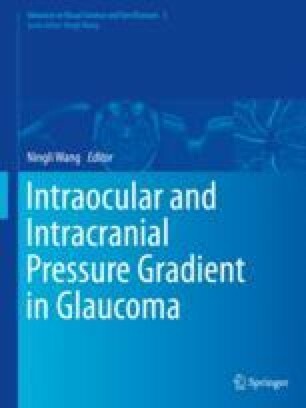 The trans-lamina cribrosa pressure difference (TLCPD), which is defined as IOP minus CSFP, may be more important for the development of glaucomatous optic neuropathy [3, 5–8, 11–14]. Study on the damage of optic nerve in reduced CSFP animal models has further supported the hypothesis [15, 16]. However, mechanism of reduced CSFP on the optic nerve damage has not been elucidated yet.